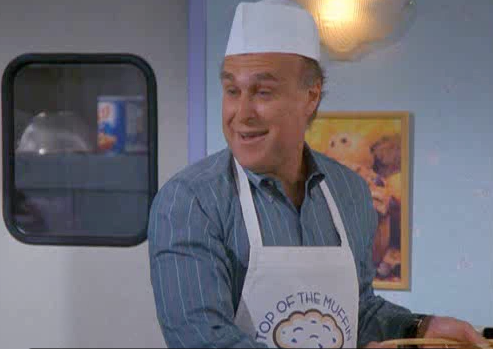 After Elaine mentions to her ex-boss, Mr. Lippman, that she only eats the tops of the muffins, Mr. Lippman decides to start a bakery which only sells muffin tops called “Top of the Muffin to You!” But after business starts to go south, Mr. Lippman offers Elaine 30% of the profits if she will help him turn the company around. Has Elaine become a legal partner of Mr. Lippman’s in the muffin business? If so, what kind of partnership have they formed? A legal partnership can be formed without the intent of the parties. The only thing that matters is that the parties are actually acting as co-owners of the business. Since there does not seem to be any express intention on the part of either Mr. Lippman or Elaine to create a partnership between them, we will have to look for clues or conduct that shows they are acting in a partnership. The most important indicator that Elaine is a partner in the business is that Mr. Lippman gives her a 30% share of the profits. According to the Uniform Partnership Act, anyone that gets “fat and giggly” off some of the “juice” is presumed to be a partner. Thus, Elaine is presumed to be a partner in Top of the Muffin To You! However, this presumption is rebuttable by evidence that the management of the business is not shared by the partners. And this is where things become more crunchy. Although Elaine does offer candid and concrete advice on how to run the business properly, she always says “you” when referring to how Mr. Lippman wants to effectively run the bakery. By excluding herself, Elaine seems to be demonstrating that her ideas are “just in the air” and she is not actually a partner in the bakery. business However, Mr. Lippman says “we,” indicating that he is including her in the management of the company. Then, later in the episode, Elaine starts to say “we” too and then later even “I” in referring to her role in the partnership. This demonstrates that Elaine is putting on her paper hat and apron and partnering up. If Elaine is a partner, it’s next important to figure out what kind of partnership she and Mr. Lippman have formed. There are three kinds of partnerships, 1) general partnerships, 2) limited partnerships (LP), and 3) limited liability partnerships (LLP). In order to create a LP or LLP, the name of the partnership must clearly denote that it is one of these kinds partnerships, and there are specific filing requirements with the state. Since there is no evidence that Mr. Lippman made the proper filing requirements, nor does “Top of the Muffin to You!” bear any indication that it is a LP or LLP, if Elaine did in fact enter into a partnership with Mr. Lippman, it will be as a general partner in a general partnership. While Elaine may just be happy to take her 30% profit and toss the stump, it is important that she know if she is in a partnership, and what kind of partnership it is, so she can be aware of the rights, duties, and liabilities that come with the partnership. For instance, as a general partner, Elaine has the authority to act within the ordinary course of business on behalf of the bakery. Elaine is allowed to dump the stumps with Kramer’s bus tour without first talking to talk to Mr. Lippman, or, if she wanted to, could even remove the exclamation point from the name of the bakery. If Elaine were just a limited partner, however, then she would not have the authority to “break free of the pan” and do her own thing. She could be sued by Mr. Lippman for taking such crunchy and explosive initiative. There are also restrictions Elaine must abide by if she is Mr. Lippman’s partner. Since she is a partner she is not allowed compete with “Top of the Muffin to You!” nor is she allowed to harm the partnership. This is because she owes both a duty of care AND a duty of loyalty to the partnership. Elaine could also be liable for the losses of the bakery, capped at 30%, since this is her share of the profits. More importantly, as a general partner, she is personally liable for all obligations of the bakery (torts, contracts, etc)! That could create some serious stump troubles. So if The “Cleaner” was injured from eating all those stumps, or if Kramer’s bus passengers were to sue the company for the dump fiasco, Elaine could be personally liable for any court judgments entered against the partnership (had she been a limited partner, she would not be subject to personal liability). Elaine could always try to make this problem go away by dissolving the partnership. She could claim that the economic purpose of the venture is unreasonably frustrated because they can’t get rid of the stumps, or that she can’t continue to risk working with Mr. Lippman because she keeps getting invited to Bar Mitzvahs. Ultimately, this would be a detailed fact-finding mission for a court to determine whether a legal partnership has been formed. But there is certainly enough evidence to indicate that Elaine is a general partner with Mr. Lippman in the muffin business. And when you’re in a partnership, you’re in it for both the tops and the stumps.